As a freelance writer it’s sometimes hard to leave your work behind, even when on holiday. That’s why I find myself turning off the alarm at 05:30 during my holiday, and lacing up my hiking boots. My friends and I are going to hike the Pointer Trail in Karoo National Park. Since the introduction of lion in the park in 2010, this route is a 4.9km guided walk that travels along the middle plateau close to the main camp. Jan Jacobs is our guide. He has over 25 years of guiding experience in the park and, as his Kids in Parks cap reveals, his passion is educating groups of learners about the country’s natural heritage. 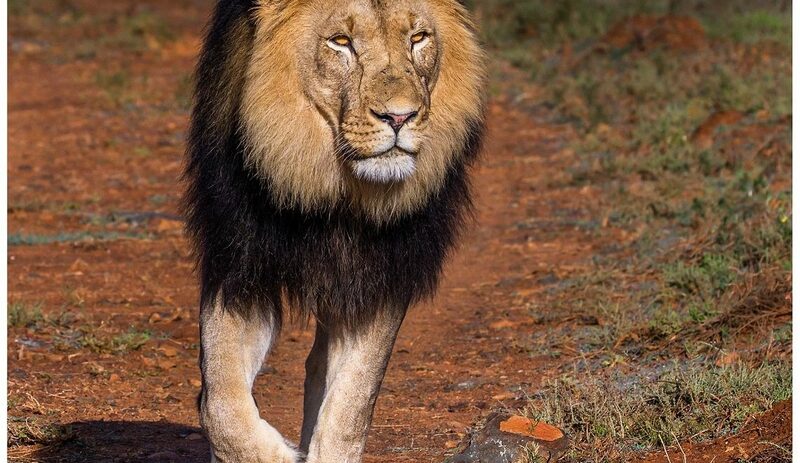 “The confident way a lion walks around in the park can teach us much about leadership,” he says. 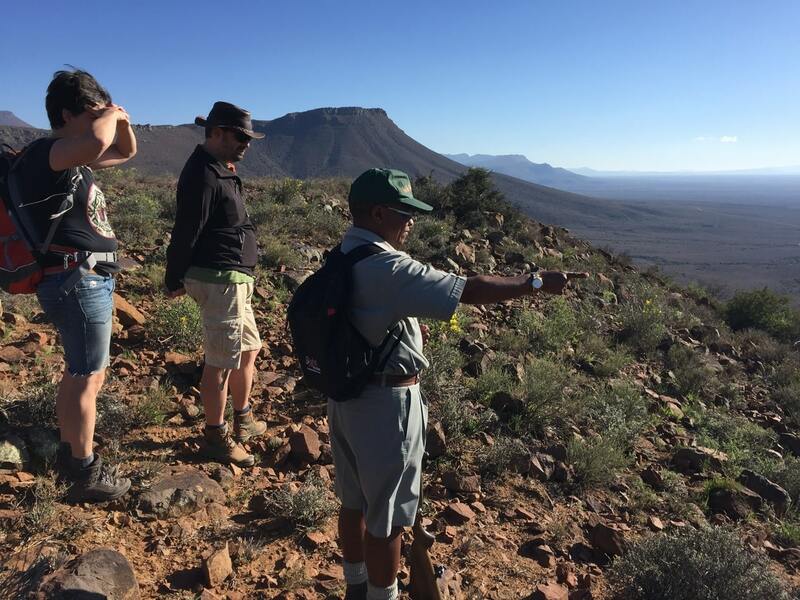 Jan takes us up the mountain slope, letting us catch our breath regularly while telling us about the diverse Nama-Karoo vegetation found along the way. As we reach the top of the plateau, we’re treated to spectacular views over the park as well as a beautiful sighting of some Cape mountain zebra. The mountaintop is covered in fynbos, a striking sight combined with the clear blue sky above it. On the mountain, Jan shows us signs of Smith’s red rock rabbit, the smallest rock rabbit in southern Africa. The presence of porcupine is also apparent, as some have dug up the roots of a Karoo gold bush, so pretty with its yellow flowers. Jan lets us compare the dung of tortoise (pretty big) to that of red hartebeest (surprisingly small), and allows us to taste bokkos, a succulent which we think would go very well with a gin and tonic. 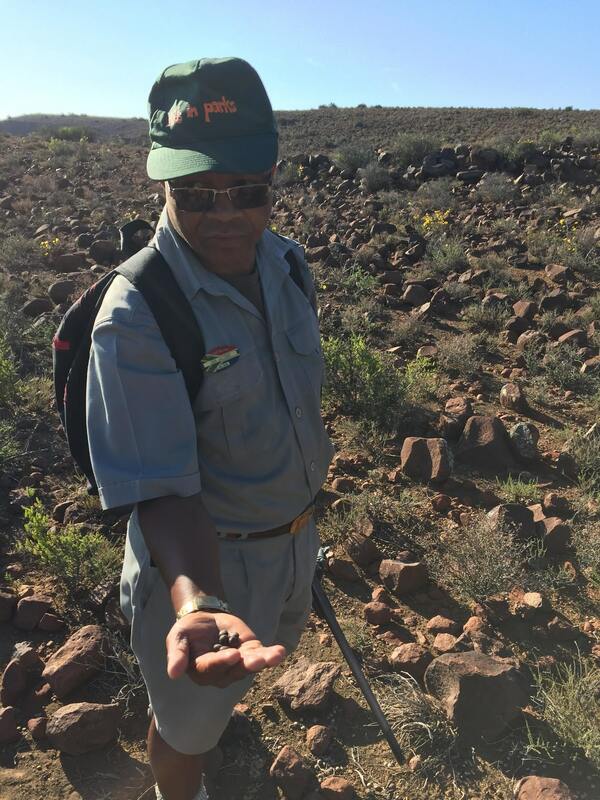 Guide Jan Jacobs showing the droppings of Smith’s red rock rabbit droppings. As an encounter with lion is a possibility, only visitors over 12 are allowed on the guided walk. 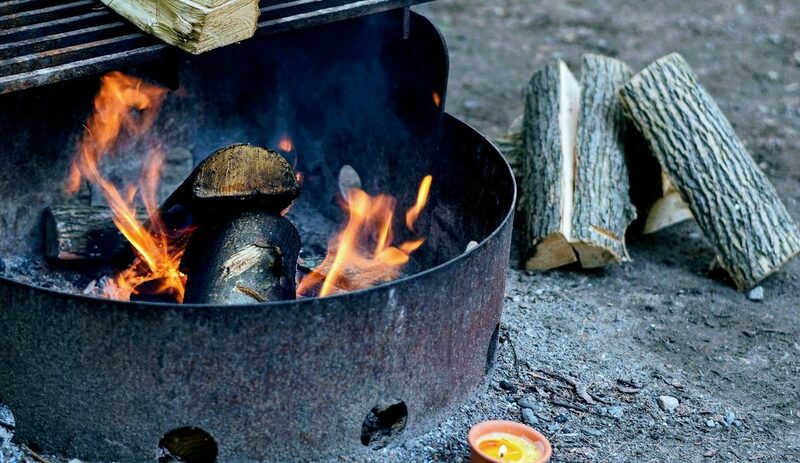 Younger family members, however, can still enjoy the interesting 400m Fossil Trail in camp. 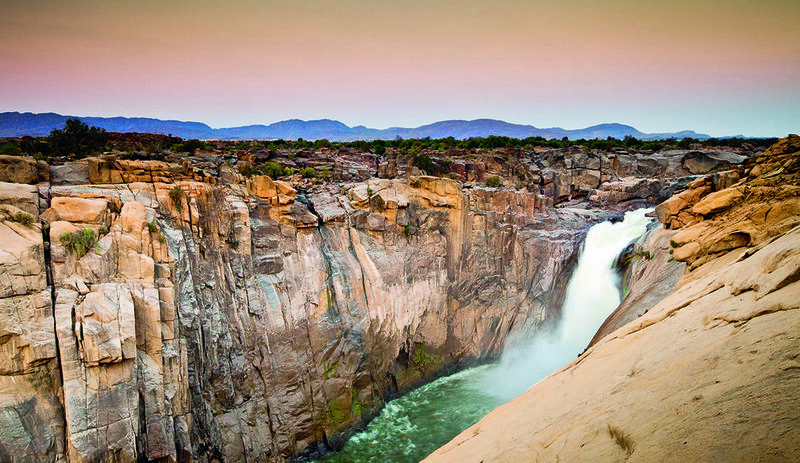 It tells you much about the fascinating history of the area, its geology and its early wild inhabitants. Another option is the Bossie Trail (950m), which gives you more information on the vegetation along the way. If you’d rather not leave the comfort of your car, there are several 4×4 routes to try out, for beginner to experienced 4×4 enthusiasts. Make sure you set off before 15:00 though, so you have enough time to make it back before the gate closes. After the trails a plunge in the sparkling pool is absolutely impossible to resist. The pool, filled with ground water, is supremely refreshing on a hot day. Best of all, you may even spot a mountain zebra or tortoise while you relax. 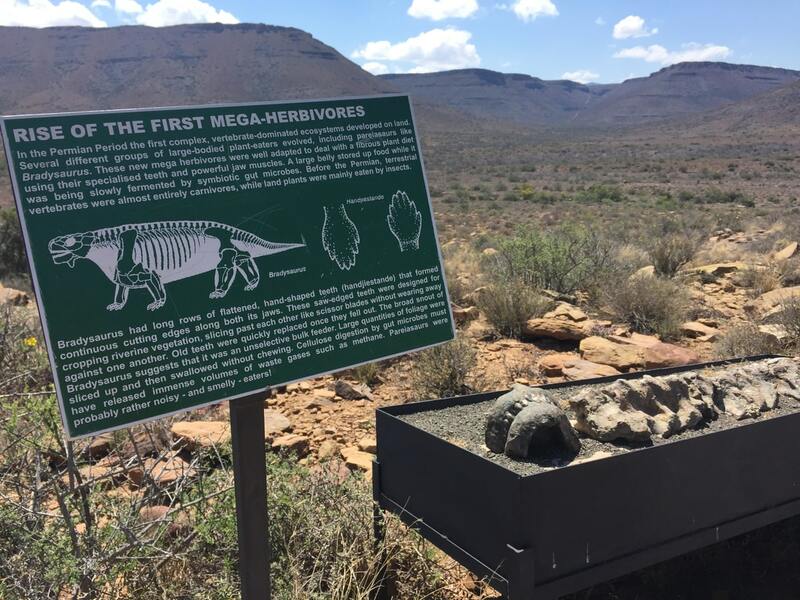 The Fossil Trail features the bones of prehistoric animals that once lived in the area. Imagine encountering one of these enormous creatures in the park! Guided walks depart from reception at 06:00 in summer and 07:00 in winter. Cost: R233 a person. Book with reception the day before.